For electrical maintenance managers and employees, electrical safety is the main goal. 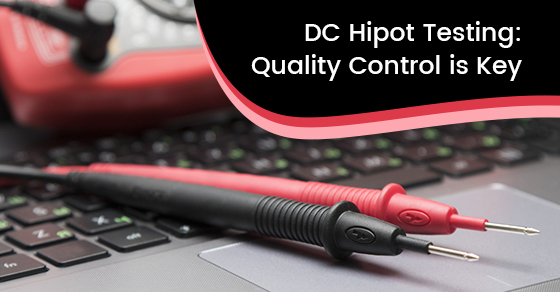 DC hipot testing is a key step in quality control to be certain that only safe, functional cables are being used, whether in a commercial electronics setting or for the consumer. When it comes time to install new cables, the hipot test is a very important task to be carried out. What is DC Hipot Testing? The term “DC hipot test” is shorthand for the high potential (high voltage) test, also known as the dielectric withstand test (or dielectric strength test). A hipot test checks to ensure that no current will flow from one point to another point. Hipot testing is applied to check whether any degradation has occurred. This test typically follows a sequence of other tests such as humidity, fault condition, and vibration. The hipot test is the opposite of a continuity test. A continuity test determines whether a current can flow undeterred from one point to another point, whereas a hipot test checks to ensure that a current cannot flow from one point to another point. One of the main uses of DC hipot testing is to confirm the safety of new cable installations and proper handiwork of cable accessory installation. Electrical stress is applied to the cable with the intent of finding any major problems due to mechanical damage, manufacturer defects, or accessories that are improperly installed. A functional, properly installed cable is designed to withstand three times its rated voltage, to be able to tolerate fluctuations in generator voltages or voltage transients during a heavy storm. If the hipot testing step is skipped, there is no way to be sure that the cable will actually tolerate voltages according to its specified rating. The hipot test is important because it tests for the adequacy of electrical insulation during times of too high a voltage. Hipot tests are the best way to discover inadequate creepage and clearance distances introduced during manufacturing, braided shielding, terminal spacing problems, tears, rips and other damages in insulation, stray wire strands, conductive or corrosive contaminants around the conductors, and tolerance errors in cables. Production-line hipot testing occurs during the manufacturing process, to check whether the construction of a production unit matches the construction of the unit that was subjected to type testing. A production-line hipot test may catch process failures such as a transformer with reduced creepage. Process failures could also include a pinhole defect in insulation or an enlarged solder footprint. The standard duration for DC hipot testing is one minute. The standard test voltage for hipot testing is two times the operating voltage plus 1000V. The reason that 1000V is added is that research has shown that overvoltages can reach this high. The basic method is to connect one side of the supply to a grounded conductor. The other side of the supply is connected to the conductor being tested. With the supply connected in this way, there are two places that a conductor can be connected, to ground or to high voltage. If you are hipot testing more than two contacts, one contact must be connected to high-voltage and all other contacts are connected to a grounded conductor. Testing in this way verifies that a contact is isolated from all other contacts. If the two contacts have sufficient insulation between them, then the application of a large voltage difference between the two will result in the flow of a gentle current. While most hipot testing devices today allow the user to set the current limit, if the exact leakage current of the product is known then the hipot test current can be calculated. To discover the trip level, test a number of product samples and establish an average hipot current. After an average hipot current is determined, the leakage current trip level should be set to a number that is just above the average hipot current. Open the switches or circuit breakers to isolate the cable or circuit to be hipot tested. Insert barriers around the terminations of cables and equipment under testing to keep persons without electrical training from entering your work zone. The boundary around your work zone should be at least 1.6 metres. Ensure that a suitable building ground or grounding electrode conductor is accessible, and connect the ground lead of the hipot tester to it. Connect the high voltage lead to one of the isolated circuit phase conductors. Turn on the hipot tester and set the meter to your predetermined voltage, typically 1000V. On the meter, find and engage the button marked “test”. For one minute, note the resistance reading and keep a record of the reading. Note if there is any indication of breakdown. Switch the tester from the high potential test mode to the voltage measuring mode in order to verify that the circuit phase conductor and voltage of the tester are now reading 0V. Repeat the testing procedure for all circuit phase conductors. It is important to test each phase to ground and each phase to each phase. Once testing is finished, disconnect the tester from the circuits and ensure that the circuits are clear to be re-connected and re-energized. For safety during hipot testing, never touch the cable with bare hands and always wear insulating gloves. Remember to correctly handle the equipment during calibration. Wait for the hipot testing to be fully complete before removing the cable. Never allow persons without electrical training to access the equipment, being especially vigilant of children’s access. If you have any electronic implants, do not use the testing equipment. For more information, please call Circuits Central at 1 (888) 602-7264 or contact us here.